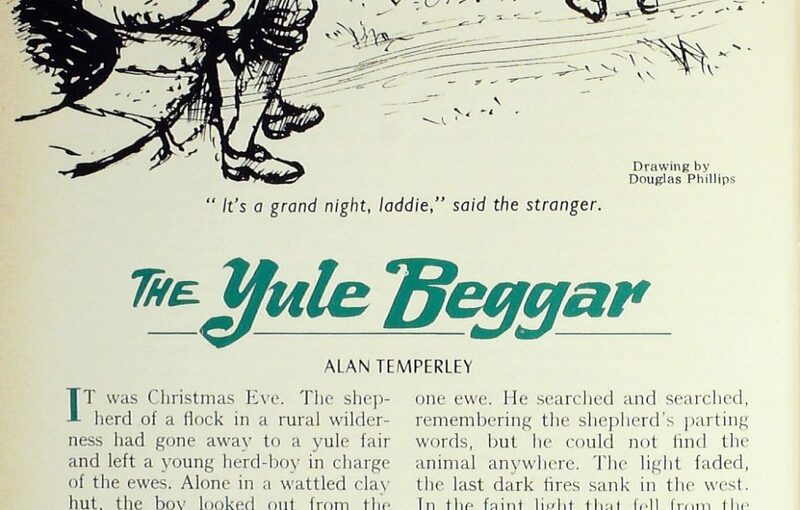 Here’s an auld Scottish Christmas tale from the depths of our archives. It’s said to have originated around the late 1500s. IT was Christmas Eve. The shepherd of a flock in a rural wilderness had gone away to a Yule fair and left a young herd-boy in charge of the ewes. Alone in a wattled clay hut, the boy looked out from the fire and saw that the short afternoon light was already fading. His master had left strict instructions that all the sheep must be in before dusk, for in those days they easily got lost, and wild animals sometimes killed them in the darkness. Also, it was wintry weather and the snow might come. Pulling on a ragged jacket, the boy went out into the cold afternoon to bring in the flock. Soon he had them rounded up and safely penned for the night -all but one ewe. He searched and searched, remembering the shepherd’s parting words, but he could not find the animal anywhere. The light faded, the last dark fires sank in the west. In the faint light that fell from the evening sky through gaps in the cloud he searched on, fearing to let down his master. At length, after hours of wandering in the darkness, filling his boots with icy bog water, scratching his face and hands on briars and the twigs of thickets, he stood once more by the little clay hut. Dejected he went in and sat by the side of the dying fire. After a while he stirred the embers into life and threw on a few twigs and a couple of peats. He pushed off the hard, broken boots and nursed his bare feet in the warmth. Soon the moon would rise. He would wait until then and go out again, although he had little hope of finding the lost sheep. Then, suddenly, he thought of St Ringan’s Well, which lay a little distance away. People often went there in time of trouble to enlist the saint’s aid—sometimes people who had lost things. 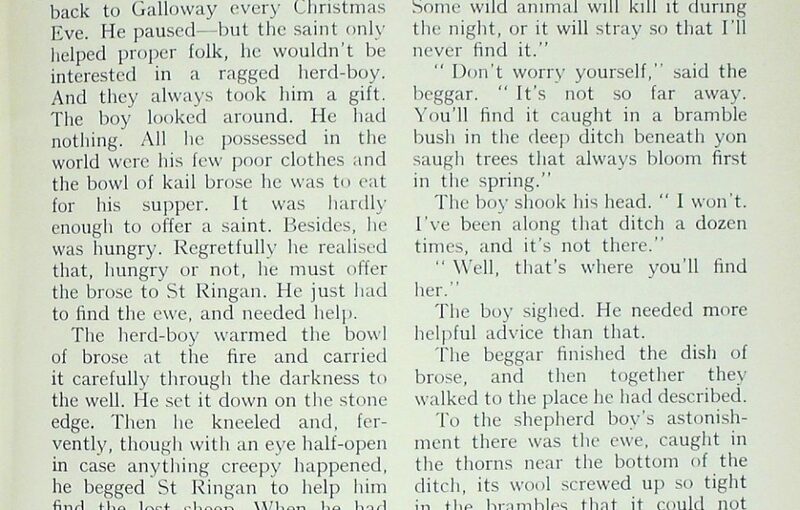 And it was Christmas Eve: St Ringan was said to come back to Galloway every Christmas Eve. He paused— but the saint only helped proper folk, he wouldn’t be interested in a ragged herd-boy. And they always took him a gift. The boy looked around. He had nothing. All he possessed in the world were his few poor clothes and the bowl of kail brose he was to eat for his supper. It was hardly enough to offer a saint. Besides, he was hungry. Regretfully he realised that, hungry or not, he must offer the brose to St Ringan. He just had to find the ewe, and needed help. The herd-boy warmed the bowl of brose at the tire and carried it carefully through the darkness to the well. He set it down on the stone edge. Then he kneeled and, fervently, though with an eye half-open in case anything creepy happened, he begged St Ringan to help him find the lost sheep. When he had finished he stood up. Nothing had changed. He waited, looking around into the dark bushes. No bleat came to his ears. 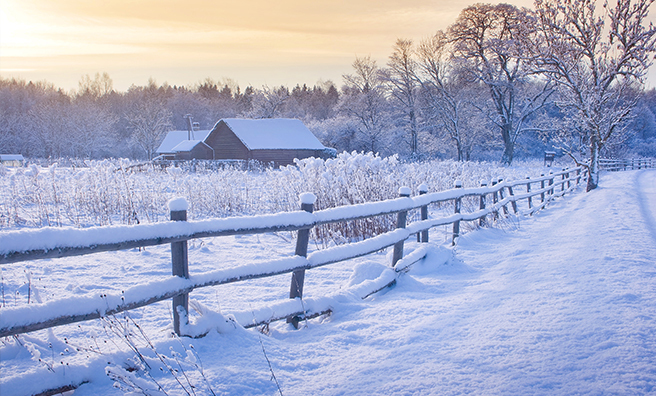 Through clear, widening gaps between the clouds, like tracks of water, the stars glittered frostily. A bitter breeze chilled his face and felt through his jacket. With a last, longing look at the dish of brose, the hoy turned away and began to walk back to the hut. He had not gone verv far when lie heard a little noise behind him. Turning, he saw a thin, ragged man sitting on the edge of the well, supping the brose. The herd-boy began to protest—he had left his supper for a saint, not this tattered beggar. Then charitably he thought that since St Ringan had not turned up the poor hungry man might as well have it. “I wish it was,” the herd-boy replied dejectedly, coming back. The boy sighed. He needed more helpful advice than that. The beggar finished the dish of brose, and then together they walked to the place he had described. To the shepherd boy’s astonishment there was the ewe, caught in the thorns near the bottom of the ditch, its wool screwed up so tight in the brambles that it could not move. He scrambled down through the tangled vegetation until the verge was high above his head. His boots went through the cat-ice into the water and mud. And no matter how he tugged and tore at the thorns, the boy could not release the sheep. The beggar joined him deep in the cold ditch, and somehow, together, they pulled the wool apart, broke off the bramble stems, and hauled the animal up to the grassy brink. But the sheep was so far gone with exhaustion and cold that it could not stand and slumped to the ground when they released it. The boy was not yet strong enough to carry it and he looked down at the forlorn beast. For answer the beggar bent, and catching the sheep by the legs slung it around his shoulders. Side by side, they returned to the little clay hut and set the tattered animal down by the still-glowing lire. The herd-boy was bending to pick up sticks for the fire. When he looked up the beggar was nowhere to be seen. Quickly he crossed to the door and stared out into the cold night. The beggar had gone. But there, by the rising moon, was a glittering pathway that led from the poor doorway of the little clay hut straight to the East. It is a very old tradition that St Ninian, or Ringan, who founded the great Celtic monastery at Whithorn in 397 A.D., returns to Galloway every Christmas Eve. He reveals himself, however, only to simple, God-fearing shepherds, such as the shepherds in the Gospels. In addition, St Ninian is recognised, in Galloway at least, as the patron saint to whom people appeal when they have lost things, particularly sheep. I first heard this traditional tale, The Yule Beggar, two years ago in Kelton Kirk, my parish church, a mile from Castle Douglas. It was told to the children at Christmas by a lady, Mrs Elspeth Cooper, M.B.E. She had been told the story many years before by a close family friend, Miss Marjorie Dunn, who was the great-granddaughter of Joseph Train, the eminent antiquarian and correspondent of Sir Walter Scott. When she was a girl, Miss Dunn had heard the tale from an old lady named Janet Tait. 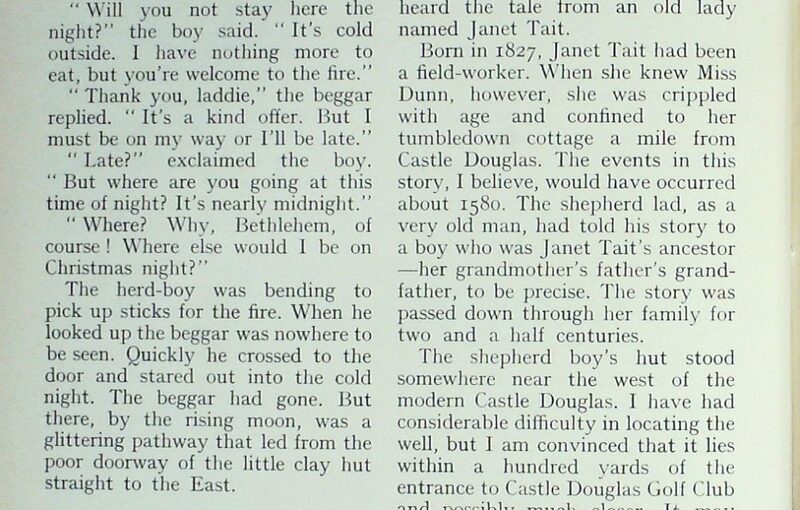 Born in 1827, Janet Tait had been a field-worker. When she knew Miss Dunn, however, she was crippled with age and confined to her tumbledown cottage a mile from Castle Douglas. The events in this story, I believe, would have occurred about 1580. The shepherd lad, as a very old man, had told his story to a boy who was Janet Tait’s ancestor —her grandmother’s father’s grandfather, to be precise. The story was passed down through her family for two and a half centuries. The shepherd boy’s hut stood somewhere near the west of the modern Castle Douglas. I have had considerable difficulty in locating the well, but I am convinced that it lies within a hundred yards of the entrance to Castle Douglas Golf Club and possibly much closer. It may be the well which is still to be seen in the club practice ground. If any reader should have precise knowledge of the well in the story, however, I would be glad to hear it. The ditch where the saugh (willow) trees bloomed first in spring lies two hundred yards beyond the well I have described, farther into the golf course. With the development of the golf club, the ditch was cleared and drained about 1920 and half-filled with earth.